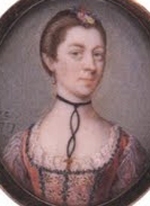 From 8 January 1778, her married name became Smith. From 7 February 1778, her married name became Bromley. From 6 April 1803, her married name became Pauncefote-Bromley. Child of Hon. Esther Curzon and Sir George Pauncefote-Bromley, 2nd Bt. [S6] G.E. Cokayne; with Vicary Gibbs, H.A. Doubleday, Geoffrey H. White, Duncan Warrand and Lord Howard de Walden, editors, The Complete Peerage of England, Scotland, Ireland, Great Britain and the United Kingdom, Extant, Extinct or Dormant, new ed., 13 volumes in 14 (1910-1959; reprint in 6 volumes, Gloucester, U.K.: Alan Sutton Publishing, 2000), volume III, page 270. Hereinafter cited as The Complete Peerage. Her married name became Villiers. After her marriage, Maria Eleanor Forbes was styled as Countess of Clarendon on 7 March 1824. [S4552] Charles Donovan, "re: Donovan FAmily," e-mail message to Darryl Roger LUNDY (101053), 28 March 2010. Hereinafter cited as "re: Donovan FAmily." Her married name became Townshend. After her marriage, Elizabeth Powys was styled as Baroness Sydney on 6 March 1783. After her marriage, Elizabeth Powys was styled as Viscountess Sydney of St. Leonards on 11 June 1789.